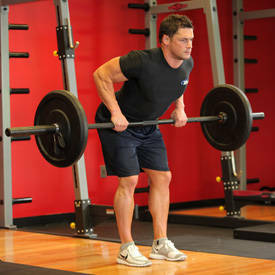 While standing straight, hold a barbell plate in both hands at the 3 and 9 o’clock positions. Your palms should be facing each other and your arms should be extended and locked with a slight bend at the elbows and the plate should be down near your waist in front of you as far as you can go. Tip: The arms will remain in this position throughout the exercise. This will be your starting position. Slowly raise the plate as you exhale until it is a little above shoulder level. Hold the contraction for a second. Tip: make sure that you do not swing the weight or bend at the elbows. Your torso should remain stationary throughout the movement as well. As you inhale, slowly lower the plate back down to the starting position. 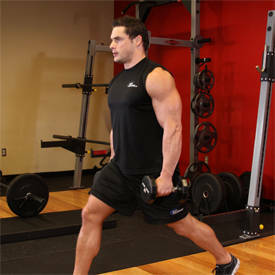 Variations: You can use dumbbells, barbells, cables or exercise bands to perform this movement. I chose these exercises because they put more focus onto the quads. Stand with your torso upright holding two dumbbells in your hands by your sides. This will be your starting position. Step forward with your right leg around 2 feet or so from the foot being left stationary behind and lower your upper body down, while keeping the torso upright and maintaining balance. Inhale as you go down. Note: As in the other exercises, do not allow your knee to go forward beyond your toes as you come down, as this will put undue stress on the knee joint. Make sure that you keep your front shin perpendicular to the ground. Wearing either a harness or a loose weight belt, attach the chain to the back so that you will be facing away from the sled. Bend down so that your hands are on the ground. Your back should be flat and knees bent. This is your starting position. Begin by driving with legs, alternating left and right. Use your hands to maintain balance and to help pull. Try to keep your back flat as you move over a given distance. Keeping the knees stationary, lower the barbell to over the top of your feet by bending at the hips while keeping your back straight. 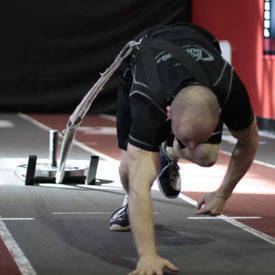 Keep moving forward as if you were going to pick something from the floor until you feel a stretch on the hamstrings. Inhale as you perform this movement. TIPS: Keep your back flat and make sure your knees are slightly bent when performing this exercise. If you have low back problems then please don’t do this exercise. Don’t use a jerking motion either and this exercise can also be performed using dumbbells. 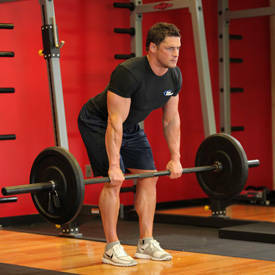 ﻿﻿Then inhale and slowly lower the barbell back to the starting position. Variation: You can perform this with supinated (palms facing up) grip. Hold a weight plate against your chest and lock your legs into a back extension apparatus. Allow your torso to bend forward so that your hips are bent almost 90 degrees . Extend your back so that your body forms a straight line . Lower your torso back down. That’s one rep. The muscles that are being worked with this exercise are: Middle and Lower Trapezius, Levator Scapulae, Erector Spinae, Teres Major and Minor, Infraspinatus, Posterior Deltoid, Brachialis, Brachioradialis, and Pectoralis Major. Set Up: Place both of your forearms on a stability ball with your legs extended behind you. Tighten your abs and lift your hips. Make sure you are balanced and stable on top of the ball [A]. Action: Hold your position as you lift one leg off the ground several inches; avoid arching your lower back [B]. Hold for two breaths, and then return to the starting position. Repeat, alternating sides. Make this move easier: Perform this move on a mat, without the ball. Make this move harder: Pulse your leg 10 times in the lifted position.